Jaclynn sat in her room, next to her dolls. She picked up one and cradled it in her arms. “I don't know what to do!” said Jaclynn to her doll, “She seems boring and it's always awkward around her. I know I shouldn't write her off as boring just yet, but I can't help it. She's going to ruin my summer,” Jaclynn sighed, “if only there was a way to break the ice between us. But she seems so distant and reserved. I don't see us becoming friends-” She stopped mid-sentence, “Wait. Maybe I can break the ice with showing her my Donut powers!” Jaclynn stood up and placed her doll back onto the floor. Nodding her head, Jaclynn skipped back to Princess Emma's room and knocked on the door. “I hope this will work!” Jaclynn murmured to herself. She heard the soft pattering of Emma's footsteps, then the door popped open and Emma's head poked out. “Oh! Come in, Princess Jaclynn,” Emma opened the door wider and Jaclynn noticed that she had already begun unpacking. A couple dresses lay on the dresser and a doll stood up on the bed. Princess Emma stared down at her brown shoes and Jaclynn noticed that the rims of her eyes were red. From crying? Jaclynn thought then shook away the thought. 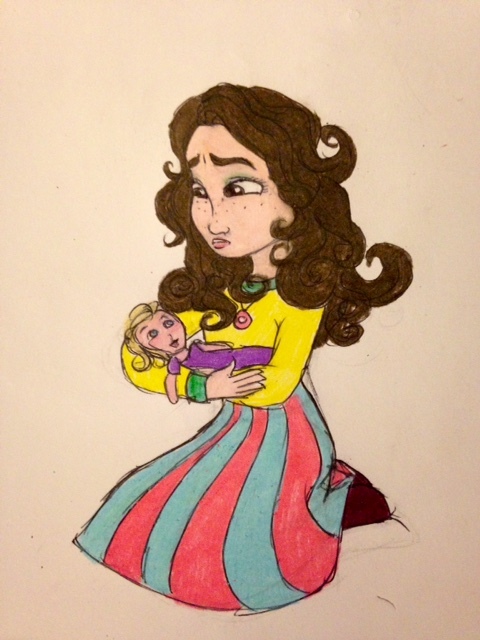 “I have something to show you!” Jaclynn grinned widely and Princess Emma's eyes grew a little rounder. “What?” Princess Emma questioned. Jaclynn sat on the rainbow rug and motioned for Emma to sit as well. Taking a deep breath, Jaclynn smiled and flexed her fingers. Three sprinkles flew from her palm and quickly disappeared. Jaclynn glanced at Princess Emma and saw her mouth hanging open. “How?” She breathed. Jaclynn shook her head, grinning. “I don't know! My parents think that because I'm a Donut, my donutness got caught up inside me and gives me the ability to make donut-themed things into existence. The side of Emma's mouth curved up in awe and she grabbed hold of Jaclynn's arm. “Do it again! Do it again!” She chanted and Jaclynn brought her hand into the sky and glaze flew to the ceiling and fell to the ground. Touching the clear glaze, Emma giggled. Jaclynn grinned broadly. Ice broken. I like it. :-) fantasy and humor- love that. While the story itself is kind of crazy and silly (in a good way) it's believable!